Clayton Murphy crosses the finish line first to win the 800-meter final in 1:44.76. Boris Berian took second place (1:44.92) with Charles Jock in third (1:45.48). EUGENE, Ore.  Charles Jock reached the final turn of the 800 meters at the U.S. Olympic Track and Field Trials in eighth place. There were nine guys in the race. The top three make the Olympic team. The math: He needed to pass five people in 200 meters. He wasn’t talking about 600 meters. The guy who was born in a refugee camp in Ethiopia, who walked with his South Sudanese parents and eight siblings from camp to camp across northern Africa for the better part of a year, who waited for his father to be released as a political prisoner, who immigrated to the United States and ultimately to San Diego, who played basketball at Mission Bay High and only joined the track team because he wanted to improve his vertical leap in the jumping events … passed those five guys and finished third. The next stop on the journey: Rio de Janeiro in August, for the 2016 Olympics. “Going way back to September, October, November,” Jock said, “I was thinking about how exciting it would be to make the Olympic team on Fourth of July, on American Independence Day. This is the country that has given me and my family so much. What my parents went through to get here, everything they’ve given up, leaving their family, means a lot to me. In many respects, the men’s 800 team represents an improbable cross-section of modern America, three exponents of the American dream. 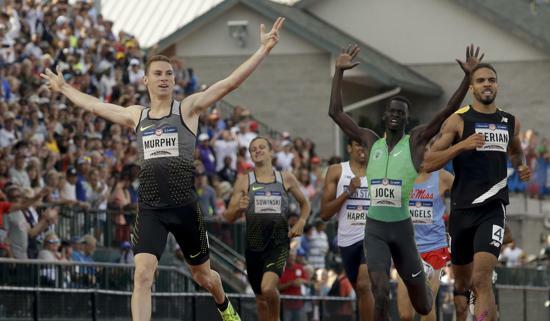 In first place at 1 minutes, 44.76 seconds was Clayton Murphy, a 21-year-old from the heartland of New Paris, Ohio (population 1,629). He attended Tri-Village High School in New Madison (population 892) and grew up on a 36-acre farm, where his extended family “grilled out” Monday night and set up a TV set to watch his race. In second at 1:44.92 was Boris Berian, who two years was sleeping on a friend’s coach, training on a dirt track and riding a bike three miles to work at a McDonald’s inside Wal-Mart in Colorado Springs, Colo., after flunking out of Division II Adams State. In third at 1:45.48 was the 26-year-old Jock. He tried the 800 only after fouling all three attempts in the long jump at a high school meet and asking coach Emmitt Dodd if he could enter another event. Dodd pointed to the starting line and told him to run two laps as hard as he could. Jock would reach the state meet in the 800 as a junior but finished second-to-last. The next year, he won it. He was leading in the NCAA final as junior at UC Irvine and got passed at the tape. The next year, he won it. But his life has been full of second chances, defined by them, sculpted by them, and he got another this week. And after moving from UC Irvine to the Oregon Track Club in Eugene and enduring three seasons of abdominal strains and hamstring pulls – last year he pulled his hammy six days before the national championships – he finally caught a few breaks. In his preliminary heat Friday, he lunged for the line and finished third by seven-thousands of a second over Duane Solomon. Jock advanced to the semifinals; Solomon, fourth at the 2012 Olympics, did not. In Saturday’s semis, Jock finished third again in his heat and only the top three advanced. His time of 1:47:35 was the slowest to survive; run six-tenths of a second slower, and he’s out. But if he needed any reminder of the frailty of the U.S. Olympic Trials, of their unmerciful cruelty, he saw it as he walked on the track Sunday and watched the final lap of the women’s 800. Favorites Alysia Montano and Brenda Martinez tangled feet with 150 meters to go, Montano crashing to the track, Martinez somehow keeping her balance but breaking stride and fading from second to seventh. Montano got up and tried to jog the remainder of the race. She collapsed halfway onto both knees, bawling inconsolably. She got up again, stumbled to the finish line and collapsed again, her wails echoing through Hayward Field – a heart-wrenching scene for an athlete who has been kept off the podium at Olympics and World Championships by juiced Russian half-milers and has been among the most outspoken proponents of clean sport. Rio, without the banned Russian track team, was her chance for redemptive glory. Moments later, the men’s 800-meter final was called to the start and the gun sounded. And soon the race from Ethiopia to Rio was in its final turn. Jock was in eighth place. “I called my mom a few hours (earlier),” Jock said. “I hadn’t called home all week. I’ve kind of been out of it. My mom just said, ‘You’re going to make this team.’ She had so much confidence in me. That washed over me, and I was calm and confident coming into this. Longtime Olympic Training Center athlete Sean Furey had an uncharacteristically poor day and finished 11th in the javelin. And made the Olympic team. He was one of only three Americans to achieve the Olympic qualifying standard over the past 14 months, and so he goes ahead of those who finished ahead of him at the Trials. That meant the OTC can claim the entire javelin team. Curtis Hostetler finished first with a personal-best 273-1, which gave him the Olympic standard. OTC training partner Sam Crouser finished fourth but, like Furey, had previously hit the standard. Fellow OTC athletes April Sinkler and Toni Smith advance to the final in the women’s triple jump. Brandon Johnson faded in the final lap of the 800 and finished eighth. Joey Uhle and La Jolla High alum Jeff Coover did not clear a height in the pole vault final. Darren Fahy (La Costa Canyon High) and Dylan Blankenbaker (Ramona High) failed to advance in the 3,000-meter steeplechase. The meet has an off-day Tuesday and resumes Wednesday with only the men’s and women’s hammer throw. The next full day of competition is Thursday.